"The human whose name is written in this note shall die." Netflix has revealed the teaser trailer for the Death Note movie, adapted from the popular Japanese manga/anime series. This live-action adaptation is directed by none other than horror maestro Adam Wingard, of the new Blair Witch as well as You're Next, The Guest, and A Horrible Way to Die. Wingard has been tweeting about this film since last year, and now we finally get our first glimpse. Death Note stars Nat Wolff (seen in Paper Towns) as the teen who comes across a book that allows him to kill anyone without any risk of danger himself. Also starring Keith Stanfield, Shea Whigham, Margaret Qualley, Willem Dafoe and Masi Oka. This looks intriguing, and I can't help but say I'm curious because of Adam Wingard, but I am not totally sold on this footage yet. A student named Light Turner (Nat Wolff) who discovers a supernatural notebook that allows him to kill anyone begins a crusade against evil in order to rule the world as a benevolent human god. Then a deadly game of cat and mouse begins when a reclusive detective begins to track down the young man, attempting to end his reign of terror once and for all. 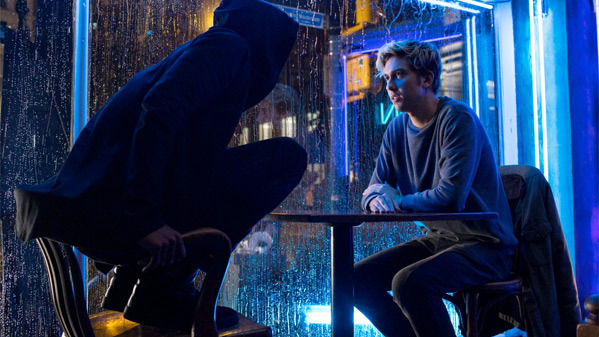 Death Note is directed by American horror filmmaker Adam Wingard, of the films A Horrible Way to Die, You're Next, The Guest, and Blair Witch previously. The screenplay is written by Charley Parlapanides & Vlas Parlapanides and Jeremy Slater; adapted from the popular Japanese horror manga "Death Note" written by Tsugumi Ohba & Takeshi Obata. Netflix will debut Death Note streaming exclusively starting August 25th later this summer. Anyone interested in this one?